One of the truly hidden gems of the park (and indeed the country) are the vast expanse of The Gardens spread across a valley at the centre of the park. 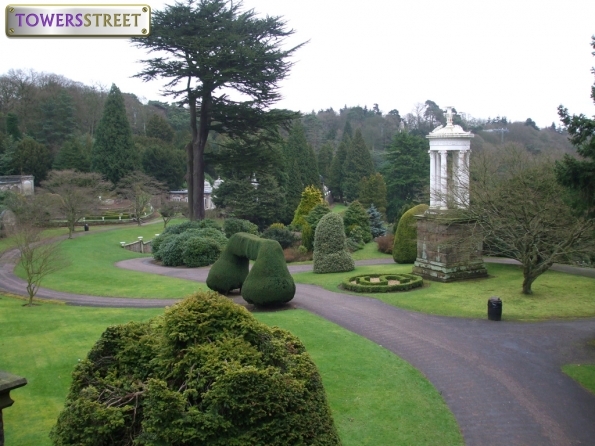 With most people's experience of The Gardens limited to walking by on their way between Mutiny Bay and Dark Forest or passing overhead on the Skyride, few guests these days take time out of their busy day to visit this truly unique feature of the park, which were largely laid out by the 15th Earl of Shrewsbury over 150 years ago. Please check back soon for more details on the historic gardens, but for now here is a brief guide to some of the features you might find during your explorations within The Gardens. As you pass under the white cast iron bridge that forms the main garden entrance from the Towers, the first sight to greet visitors is the Choragic Monument, a copy of the famous erection by Lysicrates in Athens. Sitting within its colonnade is a bust of Charles Talbot, the 15th Earl or Shrewsbury with the with the legend "He Made the Desert Smile" - a tribute to the foresight and endeavour of the Earl that transformed what had been a barren valley, riddled with rabbit warrens, into the luscious garden that surrounds you today. 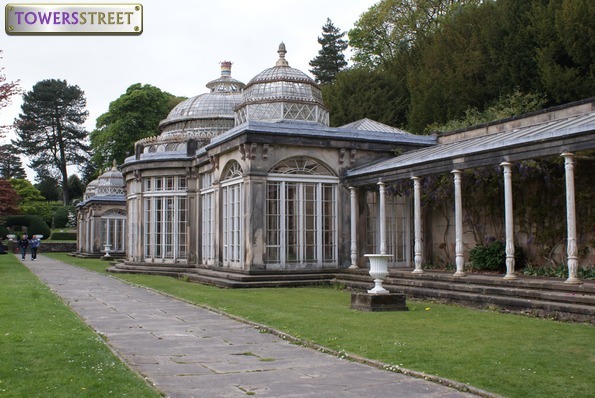 Following the upper path from the Choragic Monument, you soon happen across the remains of the park's Orangery, which would once have been glass fronted below a pair of decorative domes. Sadly, these days the building is fairly derelict, now missing one of its domes and its insides hidden behind bricked up windows. Even in it's current state sitting above a decorative pond and the iconic Dutch Garden, it provides a good idea of the majesty the gardens once possessed. Alongside the Dutch Garden sits the impressive Conservatories, which are one of the most iconic structures of the gardens, having featured in much of the parks advertising in the 90s when they were last restored. The building consists of two grand wings sweeping out from a central atrium. capped with several glass domes and various coronets of the Earls of Shrewsbury, one of the more unusual features being a palm tree, which has grown unchecked until it has passed through the roof of the of the central atrium many years ago and has now been incorporated into the building design. 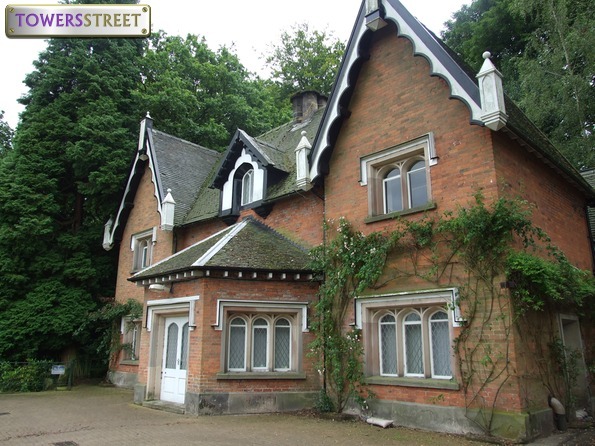 Whilst the Conservatories have served many purposes over the years, from tea shops to pottery studios, the last formal usage of the building was in the 90s and since the millenium they sat largely abandoned showing signs of decline into a state of dereliction. In 2017 however the building disappeared behind scaffolding once again for a full restoration. The path alongside the Conservatories leads to a small temple-like structure, a delightfully shaded spot in the otherwise exposed valley gardens. Whilst the temple is imposing in itself, like many of the features of the gardens it holds it own secret, as a winding staircase which leads behind the structure reveals The Grotto, a small rocky alcove hidden within the structure, and a favourite haunt of those who might want to hide away from the bustle of the theme park. Leading on from the Grotto is the Yew Walk, which is always popular with photographers of the Gardens. 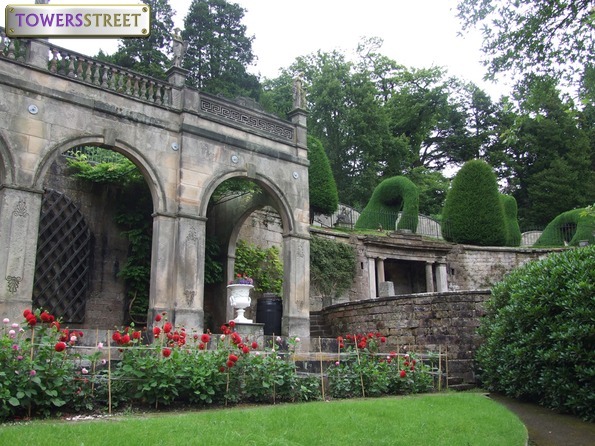 A series of fulsome topiary arches cover a path across a lawn adorned with various cherubic statutory, and towards the steps to the Corkscrew Fountain; the first corkscrew to arrive at the park, long before the famous coaster. This delightful gravity powered fountain, sometimes known as the Candlestick Fountain, nestled amidst the trees at the edge of the garden, is truly a hidden gem to be discovered. Further still up the hill behind the Corkscrew Fountain is the Gothic Prospect Tower, a three story structure which lies a short distance from the Skyride station in Forbidden Valley. It is no longer possible for the public to climb the towers, but even from the patio at its foot, the Prospect Tower offers some of the most spectacular views of the Gardens with the Towers' Ruins rising in the distance. In the rocks beneath the the Prospect Tower is one of the more unusual features of the gardens, in a cave which has been carved out of the natural rock. Whilst now this looks much like any other cave, when it was first carved it was home to a black bear, which would have been one of the big draws for visitors to the estate during the 1850s. In later years the same bear became a feature within the house itself, when it was stuffed after death. Sitting below the Yew Walk is La Refuge, a Victorian bathing pond complete with changing rooms. Whilst it is clearly some years since it was last used for its original purpose, even now it still offers up an unusual water feature. Its backdrop of a understated portico flanked by columns features a door which seems to disappear under the lawn above, which once would have allowed access to the pools changing area. Steps lead directly from the the patio area of La Refuge into the Colonnade of the Muses, a shaded walk beneath trailing clematis and wisteria arches. Looking down from the top of the colonnade are statues of the nine muses, as if overseeing the valley laid out below them. 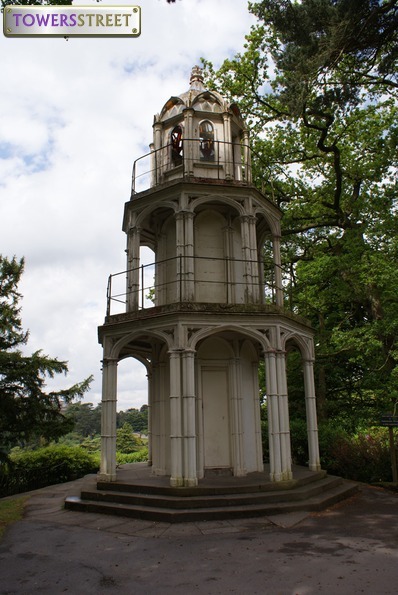 A narrow stairwell leads down from the colonnade to one of the more recent additions to the gardens, the Bandstand which dates from the 1890s when the grounds first opened to the paying public. Live bands were one of the highlights of a trip to the park, and the shape of the valley would have projected their music across much of the estate. The tradition of having live bands performing in the Gardens continued right up until the 1990s, when brass bands could still often be found performing, and though it has now been several years since the last performance, the Bandstand is still a lovely feature to admire on the way to the bottom of the gardens, or indeed to shelter under in inclement weather. The bottom of the valley is dominated by a series of water features, all fed from the main boating lake via the Rock Garden. This impressive cascade of decorative planting intermingled with miniature pools, impressive rock-work and hidden walkways spans the best part of the 200ft drop from the top of the valley to the bottom and amongst its most celebrated features is a statue of Neptune, that guests are able to pass on a series of stepping stones across one of the many pools. At the bottom of the Rock Garden a small ornamental cast iron bridge leads guests over one end of The Canal which runs through the middle of the gardens terminating just before the Bandstand. The grandiose name for this stretch of water is a rather misleading tag for what it in fact a relatively short span of water, which is more of a decorative pond surrounded by statuary. 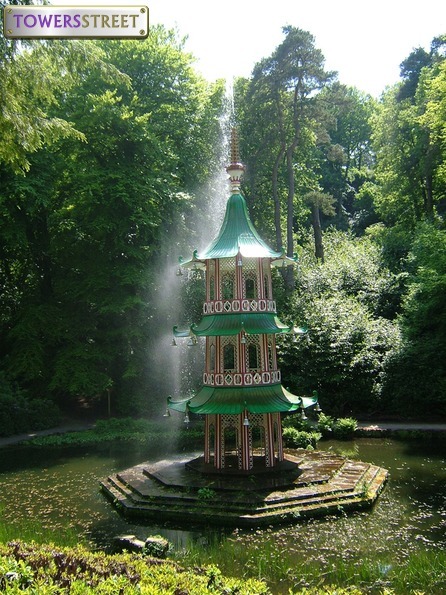 A short flight of step leads guests past the Dolphin Lake (so called due to a fountain that has long since departed), to the lowest parts of the formal garden, where arguably one of the most impressive garden structures can be found, The Pagoda Fountain. This miniaturised replica of the To-Ho Pagoda in Canton, sits on an island within its lake and uses the power of gravity to throw water so far into the air that on a good day it almost tickles the bottom of the Skyride cars as they pass over head. In comparison to the rather built up nature of the north side, the Southern side of the valley is much more naturalistic in its style, with the main built feature being the Swiss Cottage, a delightful little residence was built by the Earl to house a blind harpist, who he hired to play and who's music could often be heard drifting across the entire garden. In more recent times the Swiss Cottage has been used a fine dining restaurant, with the patio area having been added during the 1980s for this purpose; more recently however the building has been used for offices and other behind the scenes activity. The gardens were originally designed to be less built up on the southern face to allow enjoyment of the impressive views for carriages riding along the driveway along the top of this ridge, however over the years nature has taken over with rhododendrons now swallowing up many of the small wells and other features which can still be found hidden in this area. And indeed the large expanses of these bushes obscure many of the views that the gardens were designed to play upon. The southern side of the valley, once also offered guests access to the nature walks and more wild parts of the gardens beyond the Swiss Cottage, though these are now largely inaccessible to park guests.